The new Radovan & the Count novel is available everywhere today. For the first time, you can buy the latest Pathfinder Tales in Kindle format directly from Amazon. For those who love print, the new trade paperback format shows off the epic Alberto Dal Lago artwork to great advantage. Speaking of Alberto, a Creative Colleagues interview with him goes up just an hour from now, so come back to meet the mind behind the masterpiece. And mark your calendar for Thursday, June 4, when I’ll entertain questions at the fantasy subreddit. Ask me about Pathfinder Tales, my work at TSR, Wizards, and Paizo, my trips to Skywalker Ranch, Industrial Light & Magic, and Weta Workshop, or how to make the perfect Satan’s Soulpatch. Ask Me Anything. 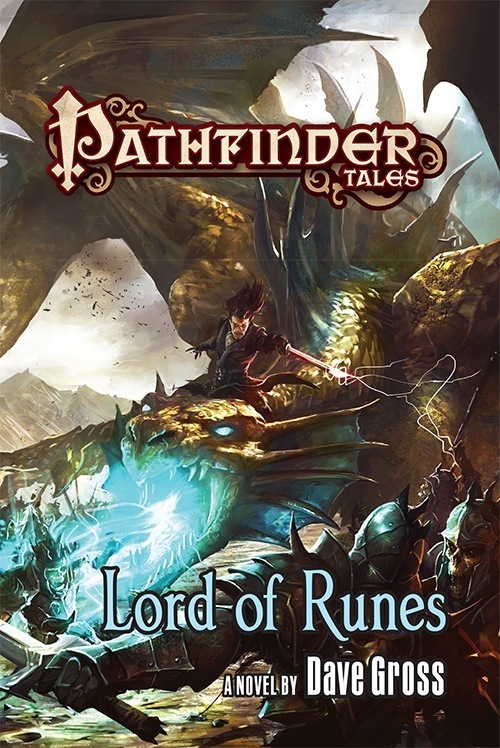 This entry was posted in Writing and tagged Lord of Runes by Dave Gross. Bookmark the permalink. I was fortunate enough to be introduced to these characters by winning an Advanced Reading Copy from Tor (publisher of the book). The book is an easy read that quickly gained my attachment to the characters & their lives. I look forward to going back to the beginning of their tales & learning how they got to where they are now.